Honoring "Earth Day" this Sunday, April 22nd with an artwork of a reptile that is from an ancient clan and is not actually on the "endangered" species, but is on the "vulnerable" list. "King Komodo" Kingly among a species of large lizards that once lived across Indonesia and Australia the Komodo Dragon can still be found on islands of Indonesia, including Komodo. Fossils have been found in Australia dating back 3.8 million years ago. They are large and in charge among the lizard species. Their group behavior in hunting is exceptional in the reptile world. This would be wonderful matted and framed, and has a very masculine feel to it. It would be great in a study or in an earthy, Old World type atmosphere. 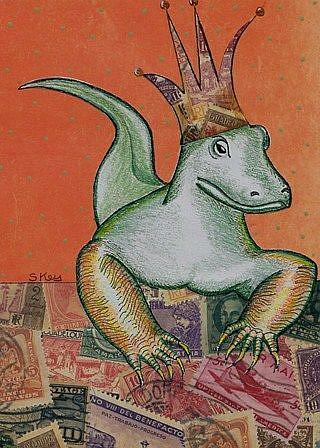 "The King" is a hand drawn cutout with a stamps design and orange paper background. 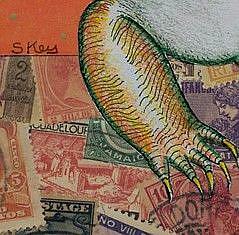 All this is on a 5" 7" piece of sturdy Bristol card stock. See all my items for sale on Ebay.